With back to school just around the corner, this is a time that many parents consider and look into kick-starting a musical education for their child. 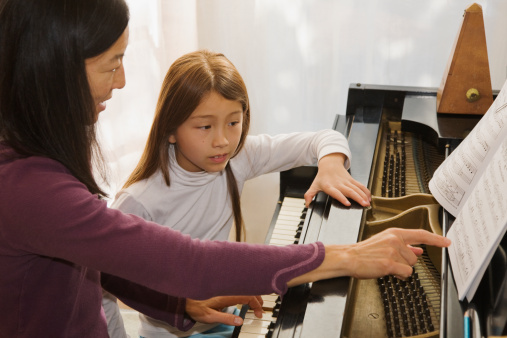 “At what age can my child begin piano lessons?” – this is one of the most common questions that I get from parents. There are no set rules, but there are pointers and signs to help determine when your child is ready. 1. Your child should be tuned into music from early on. Whether you wish to foster a musical genius or simply want to nurture a love of music in your child, it is important to take the first step of exposing yourself and your child to lots of classical, jazz and other types of instrumentally engaging music. It can be as easy as tuning into a radio station during your daily activities or spending downtime watching youtube performances. An appreciation of music will help build and maintain your child’s interest. Rhythmic patterns, harmonics, and melodic ideas will be established in your child’s musical ear, making the transition to piano lessons an easier process. 2.To start piano lessons, your child should be able to recognize numbers 1-5 (for finger numbers) and alphabets A through G (for letter names of the keys), which are all required of a beginner. It will certainly help if they are able to distinguish the difference between left and right hand. However, there’s no need to worry if the knowledge is not perfect, as many beginner books will spend a good amount of time reinforcing these ideas. 3.Your child should be able to sit still for 10-15 minutes, while being able to maintain focus and still have fun at the piano. It is often difficult for a little one to sit longer than 10-15 min at a time while keeping a strong focus on any one musical concept. In our 30 min beginner lessons, activities are switched up during class to keep students interested and engaged. Besides playing through or learning new pieces, it is common to start or interlude a class with finger number and note games, rhythmic clapping or marching exercises, and fun duets! 5. Every child is different. There are excellent students that begin piano lessons as early as age 3 or 4, while others are not ready until later. Many students that had difficulty focusing on piano at a younger age restarted later on and continued successfully, like myself! As long as the interest for music is there — that is really the only answer you need to this question!